Those numbers exclude the nine games Rhea didn't play in (five DNPs and four after he suffered a concussion diving along the sideline against Colgate Jan. 30). The Eagles were 3-6 in those games. They make it pretty clear that Rhea made the Eagles better when playing well. And that meant him making 3s. Rhea shot the same from beyond the arc as from two, 33%, but took three times as many attempts from deep (65 to 21). His role on the team was simpler than anyone else's — make shots. It took him a while, but once he did, Rhea became an absolute zone killer — particularly from the corner against the 1-3-1. Navy tried that look Jan. 27, and Rhea's 5-8 shooting from downtown was the difference in a surprising Eagles road win against one of the league's best teams at the time. Rhea's jarring shooting splits can be attributed to a couple factors. One, which coach Mike Brennan mentioned throughout the season's first months, was learning to play with the younger guys. Passes weren't always to his chest. Defenders didn't sag off. He often caught the ball away from his comfort spots. Secondly, though, Rhea got a lot of open looks and just missed them. Not getting anything from Rhea until the end of the season's third month was a reason the Eagles simply couldn't keep up offensively with opponents. Credit to Rhea for sticking with it, continuing to shoot, and finding his stroke to help American on its impressive season-ending run. Free-throw shooting: 66% (14-21) isn't good enough for such a smooth shooter. Rhea should be one of the team's top three at the line and a late-game guy. Ballhandling: Rhea's good 10% turnover rate belies the fact that he's still shaky with the ball. I know he doesn't handle it much, but if he's out there in crunch time he might be thrust in positions where he needs to. Defense: This is the area that kept Rhea on the bench for long stretches of early season games and even out entirely for full games. Rhea is not the quickest lateral defender and when he loses focus that means getting burnt and layups for the opponent. But he improved throughout the year and the effort was always there. Another summer of conditioning, and Rhea can be an average to good defender as a senior. He also needs to become a better rebounder (see below). Leadership: With Jesse Reed and Marko Vasic gone, there's once again a leadership void that needs to be filled. Charlie Jones and Rhea will be the longest-tenured active seniors on next year's team — Paris Maragkos and Leon Tolksdorf will be seniors in their second year of eligibility with the program — and regardless of whether he's on the court or not, Rhea will need to develop into an emotional leader for a team whose core will still be among the youngest in the Patriot League. The season had two halves for Rhea, and can almost be categorized as pre- and post-concussion (although pre- and post-first Navy game is more accurate). The most interesting thing to watch next year is whether A) Rhea will move into the starting lineup (doubtful) and; B) How Rhea will fit into the rotation when Brennan inevitably plays Sa'eed Nelson at point guard and James Washington off the ball. That lineup will be too small to also include Rhea, so expect him most likely to be the fourth guard for the Eagles behind those two and Delante Jones, who will also play some three. Also expect Rhea to feel more comfortable in AU's offense during the season's first three months and have a more balanced season. Raise your hand if you thought that by the middle of the conference season, Matic would be Mike Brennan's most trusted 5 man. If your hand is raised, bravo. We at the podcast certainly didn't predict that American's late recruit would overtake not just Paris Maragkos, but also Leon Tolksdorf (more of a 4) and the now-gone Gabe Brown in the rotation. This isn't to say that Matic became a star — just three double-digit scoring games is a good indicator of that being far from the case. But simply, Matic transformed from a freshman from Serbia for which the game was way too fast into the player who pulled down a tough offensive rebound at the end of the regular-season finale vs. Loyola and had the poise to go straight up and get fouled, followed by making the game-winning free throw. While Matic was actually worse than Maragkos at taking care of the ball as indicated by an abysmal 30.3% turnover rate, the stat that likely helped him move ahead of Maragkos is usage rate. Especially as the season went on, throwing the ball into Matic wasn't as much of a black hole as doing the same to Maragkos. Matic's post moves — especially his looping running jump hooks — were slow-developing and often allowed surreptitious defenders to poke the ball loose. However, when he got shots up, he converted at a 50% clip on two-pointers. I don't want to turn this into a Matic vs. Maragkos comparison, but the fact is that Maragkos' early struggles opened the door for the freshman. Matic brought a fun confidence — even a little swagger, if you can believe it — to the floor that benefited him. I won't forget him smiling widely and almost giggling while taking a free throw late in American's win over Navy in Annapolis. Matic is a self-assured kid, which helped his progression. 1) Improved ball security. Matic's 30.3% turnover rate was higher than any Patriot League player who was on the floor for at least 40% of their team's minutes. While his head was sometimes up and he looked to pass, Matic wasn't good at it. A quick, smart guard got to the ball before he could finish his move. 2) Rebounding: Matic is never going to be a dynamic player on the glass. Even at 6-10 (which is generous of AU), his lack of jumping ability hurts against the Tim Kemptons of the league. What Matic can improve is positioning and using his body and rear end to create space. His 11.2% defensive rebounding percentage is worse than anyone qualified 6-6 or taller (with the exception of Loyola's 6-foot-6 swingman Eric Laster — 10.6). If Matic improves his jumper, too, a la Tony Wroblicky 2014, he could make great strides and become the Eagles' go-to big in all games as opposed to more of a fill-in. Just 38.7% shooting on two-point jumpers and 30% from deep leave plenty of room for improvement. “He’s a good passer, he’s just doing a lot of good things out there. He’s making shots, he’s scored in the post a couple times, he’s gone after rebounds offensively and defensively. He’s doing a lot of good things. It’s not like Paris is doing poor or really bad, it’s just that Andrija is doing positive things.”- Mike Brennan on Matic after beating Holy Cross, Feb. 1. Matic managed nearly 15 minutes a game as a freshman from a foreign country playing in a complicated system behind a junior who transferred from George Washington. Additionally, 6-5 Marko Vasic, to no one's surprise, stole minutes at the 5. With Vasic gone, Matic clearly Mike Brennan's favorite by season's end at the position, no diaper-dandy freshmen bigs coming in (it will take time for Mark Gesperini to crack the rotation), Tolksdorf still more of a 4 — and who knows what role he'll play especially if Lonnie Rivera develops — and Gabe Brown gone, there is ample opportunity for the smiling, confident Matic to take over as not just the Eagles' best Serbian big with Vasic gone, but also their best big period. I wouldn't say he has the highest ceiling, but he can become a very productive and consistent player in the Patriot League. To properly critique Washington's season, it's important to start with this simple fact: The freshman was playing out of position in an offensive system that's the most difficult to run in college basketball. We said it all season long on the podcast as it was clear in November when his first two games resulted in 0 assists and five turnovers — Washington isn't a point guard. He plays better off the ball on the wing, which not coincidentally was his best shooting spot on the floor (I wish we had data on his 3-point wing shooting off the catch, because it surely was much better than his overall 28.3% shooting from deep). Washington was asked to come in as a freshman from California and at least initiate the offense of a team that lost its two most important players from the season before. The task was unfair from the beginning, and the expectations were probably too high. So when assessing Washington's strengths, it's important to view him as a wing player as opposed to a point guard. Most importantly and as a harbinger of things to come, Washington didn't back down against American's top opponents. He played his best game — which not coincidentally was also the Eagles' peak performance — in AU's 69-55 victory over first-place Bucknell in early February. Washington also gave AU a huge spark during an impressive first half at LSU (9 pts, 4-5 FGs), and had 11 points at VCU. I'm not giving him the "Big Game James" moniker just yet, but Washington isn't one to cower against the heavyweights. Additionally, while Washington's assist/turnover numbers are atrocious for the season (1.1/1.6 per game), a closer look demonstrates the progress he made at valuing the basketball and seeing the court better during February. As the season progressed, Washington played more and more off the ball. His usage rate decreased, as did — with a few exceptions, such as his four turnovers in 15 minutes vs. Navy Feb. 24 — his miscues. It's not entirely fair to harshly judge Washington's poor shooting numbers because so many of his shots came in late-shot-clock desperation situations. Washington can obviously improve in many ways, but perhaps the area that will most determine his playing time as a sophomore on a team that'll feature highly regarded freshman Sa'eed Nelson is defense. Throughout the season, it wasn't hard to locate Mike Brennan yelling not-so-nice things in Washington's direction after another lost switch or failure to get back on transition defense. The good news for Washington is that this area is, more than anything, about effort. All one needs to do to see his potential on this end is re-watch the Bucknell win when in 38 minutes, Washington was terrific at getting back defensively every possession against the Bison's fast-break attack led by speedy Stephen Brown. Washington was locked in all game, and this is the focus he'll need to bring to the defensive end of the floor in 2016-17. The other big area is shooting, where Washington will need to greatly improve his 28.3% from 3-point range to be an effective wing player — which he'll play most often with Nelson in the game — next year. Washington's 78.4 offensive rating was 57th among Patriot League players, the worst of anyone using the 19.4 possessions per game (or more) he used; his 41.9% e-FG was 37th out of 38 players who played at least 60% of available minutes; and his 41.3% two-point shooting was 49th out of 55 players who played at least 40% of possible minutes and attempted at least two shots per game. 1) Better consistent focus on defense; 2) Improved shooting; 3) Better ballhandling. “It’s not just one (area of improvement) — just playing, just college basketball’s hard and it’s a lot for a freshman. He’s playing 30 something minutes, the guy’s playing a lot of minutes as a freshman handling the ball, guarding guys, it’s a lot of work." It was a difficult season for Washington on a team that struggled mightily into late January. At times, the freshman didn't look like a Division I player. However, then there were the sparks he showed, such as the 19-point outburst at New Hampshire, the first half against LSU, and the entire Bucknell game. Would you rather have a player who never really does anything? Or a player who occasionally shows great potential despite many struggles? The answer is easy — the latter. It's hard to predict Washington's sophomore season, but being in a new role will benefit him. How much off guard vs. point he plays will depend on the progression of Nelson, but overall expect a more mature, better-shooting and better defender on the court for the Eagles next November. Despite his and the team's struggles, Washington kept his body language relatively positive throughout the trying season — a positive sign, above all else, as he heads into a sophomore year where he could make a big jump on a team stacked with potential. As the season progressed, Jones became more comfortable in Mike Brennan's Princeton offense and got to the point of being considered the go-to guy in late-game situations. Never was this more evident than when the floor was spaced for Jones to drive, poised, for the game-winning layup at Holy Cross in AU's third-to-last regular-season game. Jones' overall numbers bear out how he became the focal point of the Eagles' patient, passing approach. He used 23.6% of AU's possessions, most on the team of the Eagles' core players (Paris Maragkos' rate is a team-high 30.8%, which might be why his playing time declined -- throwing to him was a black hole). Early in the season, Jones was simply a shooter. Four of his five double-digit scoring games in nonconference play revolved around him making at least two 3-pointers (his favorite spot was the right wing). In early January after one of the low points of the nine-game losing streak -- a 56-37 home loss to Colgate -- Mike Brennan said he thought Jones and the other freshmen looked worn out and needed some rest. Things didn't improve right away for Jones or the Eagles, who lost four more in a row, but improvements in Jones' game soon became clear. More attacking the rim. A precocious ability to shift his body in ways to get whistles and get to the free-throw line. Jones transformed himself from an outside shooter to a multi-pronged offensive threat in a manner of games, becoming the first AU freshman in at least a decade to score 23 points in back-to-back games, and scoring in double figures in 15 of AU's last 16 games. Jones shot a team-best (among rotation players) 67.2 % at the rim for the season, per hoop-math.com, and his 47.4% FTA/FGA was second only to Charlie Jones. 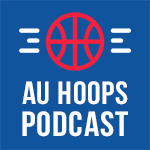 Jones attempted at least five free throws in 12 of those final 16 games, of which AU won nine. Jones' FT rate was ninth in the Patriot League. Jones' Rookie of the Year campaign in the Patriot League has AU fans salivating about his four-year potential, and rightfully. Jones is smooth, can score in multiple ways, and has clutch genes. That much is clear. Offensively, can he improve his mid-range game? Jones shot just 32.3% on mid-range jumpers, per hoop-math.com. As more and more teams make him the number one priority in scouting reports, they'll run him off the 3-point line and crowd the paint. Can Jones shoot better with his silky release in the middle area? And can he get better at distributing and not turning it over? Jones' 13.7% assist rate was toward the bottom of the Eagles, and he often had his head down on drives before trying last-second passes that led to turnovers and fastbreaks on the other end. Jones' 21.6% turnover rate was 12th highest in the Patriot League, and his 2.6 giveaways per game was tops for the Eagles. Improved vision and ball-handling should be an offseason priority for Jones. Brennan spoke often in February about Jones' overall improvement, and that included the defensive end. As conference play wound down, he had fewer and fewer breakdowns and lost switches. Still, if Jones is to become a first-team all-league player, he must make playing sound defense a priority. Too often, he was caught out of position. The only Eagles with worse defensive rebounding percentages were guards James Washington and Jalen Rhea. Jones will emerge from the summer much more muscular, a better ballhandler, defender and rebounder. He'll struggle a bit initially on the offensive end without the quick cutting and passing Jesse Reed and Marko Vasic, but freshman Sa'eed Nelson will help relieve some of the pressure and Jones will develop into an all-league player as a sophomore.